If you speak to anyone trying to lose weight or looking to bulk up on essential vitamins and minerals, they’ll tell you that flaxseeds are the ultimate powerhouse of nutrition. They’re tiny nutty-flavoured seeds that not only taste good but have innumerable health benefits. They’re extremely versatile and can be sneaked into almost everything you eat. Linseeds or flaxseeds usually come in two different colours, brown and yellow, but the nutritional profile of both is absolutely identical. 1. Omega 3 Fatty Acids – Omega-3 are polyunsaturated fatty acids, considered as essential nutrients that our body can’t produce but needs to maintain good brain health and cognitive function. 2. Rich in Lignans – Lignans are naturally occurring forms of the female hormone estrogen and are found in certain foods. 3. Good source of Mucilage – Mucilage helps assures a healthy intestine and proper absorption of nutrients. 1. Flaxseeds are good for the heart – Flaxseeds are rich in alpha linolenic acid which prevents inflammation and protects blood vessels from damage. Researchers showed that regular intake of these seeds lowers LDL (low density lipoprotein or bad cholesterol) and increase levels of HDL (high density lipoprotein or good cholesterol). 2. Flaxseeds are rich in antioxidants – Flaxseeds are significantly higher in antioxidants compared to fruits or vegetables. Adding flaxseeds to your diet boosts your overall and also helps in delaying ageing. 3. Flaxseeds prevent cancer – Studies show that eating flaxseeds reduces the risk of breast cancer, prostate and colon cancer. 4. 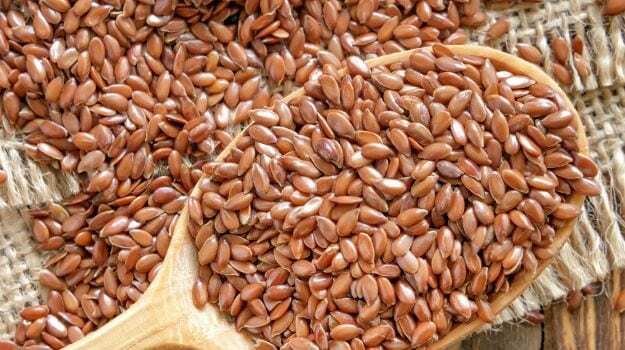 Help with digestion and weight loss – Flaxseeds are high on fiber which is why they help in relieving constipation. They also leave you feeling full which stops you from overeating. Listen up ladies! Flaxseeds with their wonder properties are a brilliant solution for all kinds of hormonal problems. Due to their high content of lignans, flaxseeds help reduce high levels of estrogen and also boost low estrogen levels. They can help reduce menopausal symptoms, such as flushing and night sweats. Flaxseeds can also help women with irregular periods and those with extreme symptoms of PMS – for example, headache, anxiety, mood swings etc. They also help in controlling heavy bleeding during menstruation, reduce the risk of breast cancer and improve uterine function. These are few things that a student has to keep in mind to study effectively. Small changes in your study plan can have some extra-ordinary results on your report-card. Need today is for smart learning that comes in with panning. So plan well your goals and plan to achieve your goals. It is really important to know your goal well. Proper knowledge about what you want to achieve and your action plan towards your goal is must. You cannot plan your career path without deciding which field you want to be in and what are your future goals. So it is well advised that be clear in your mind about your gaols and accordingly formulate a plan to achieve your goals. Once you know what you have to achieve sit down with a pen and paper and formulate an effective study plan that includes time for studying as well as leisure activities. Remember ‘all work no play makes jack a dull boy’. It is very important to have time for recreational activities also as you need an overall personality to achieve big and also your health is equally important. There is no point studying whole year, if you cannot appear for your exam owing to health issues that you created yourself by ignoring your health. Human body has its own needs out of which socialization and fun plays an important part. Make sure that you include in time for fun and recreation too. Before you plan your study schedule, make sure you have your syllabus with you and you have consulted your teacher, senior or any-one that could help you out with the importance and relevance of the topics from examination point of view. Do not hesitate in seeking help, most of the people in our country feel really proud in helping others. Once you have your syllabus and you have knowledge of areas that are consistently there in exams, time well your study hours for all the topics and also give time for self-testing. Look out for different resources that may help you out to access the importance of topics as well as their weightage in your exam. Among the most valuable resources you have available to you when studying are previous tests. Looking over past tests can help you improve your exam results by helping you know what to study, how to best prepare for a test, and how to focus your in-class note taking to facilitate studying that material. Examination is not about studying a few days prior to attain some decent grades, if you really want to achieve something big in your life, you need to have clarity of each and every topic and for this you need to study all-round the year. It is better advised to study for your exam well in advance to avoid stressing during the examination time and also to have a better understanding of topics. The mindfulness class emphasizing physical and mental strategies can help a lot to maintain focus on the present moment, in the face of interrupting thoughts and perceptions. The students can integrate mindfulness into their daily activities and with a little focus during class can retain a lot. Small self-study session during evening or night after you are finished with your class can help you a lot in better retaining of the topics. It is also a fact that reduced mind-wandering in every way can lead to improved performance in your exam as well as enhancing your memory capacity. Hence it is also very important for the students to stay focussed and concentrated during their class. Once you got your study material and whole studying plan formulated, do the best you can to study the material effectively to give out best results. There are a lot of students who find studying with friends very helpful. Others do best studying on their own. Some people learn best by reading, some by writing, and some by speaking the material out loud. Discover which style works best for you. Make your notes properly and highlight the important points by either using coloured pens of highlighters so that during the revision time you have an idea that this is something worth noting. Make sure that you have studied well whole year and also practiced various mock-tests so that you are not new to the examination pattern. Do your preparation well. Examination time can be some of really stressful times that you have encountered. It is better to be prepared well in advance with your topics so that you are not under any fear or stress. Even if you are already a great test-taker you’re probably looking for that extra edge to create the best possible scores on your exams you do need to keep in mind few things that you need to do before taking important exam. Your activities a day before can affect your performance in your exam to a great extent. A day before the exam, never try to bring in some new topics and just focus on reviewing the key Points. The day before your test is less than ideal to be first learning something and can be a very bad idea and may lead to a lot of confusion. If you are studying well all round the year then you would have already mastered the material, and it is just a matter of giving that material an extra polish a day before your exam. Stay normal and avoid stressing yourself, eat a well-balanced diet. Be sure to keep your body and your brain in peak condition by feeding it the nutrients it needs to perform at its best. Do not engage in anything that can lead to stress situation. It is a better idea to motivate yourself a day before by picturing in mind your goals and how important your success is for you. Day before an important exam, a lot of students tense up, also becomes forgetful at times and take shallow breaths. To maintain your cool, be sure that you breathe deeply from the diaphragm. This will help your muscles feel better and will help to clear your head and allow you to think better. If you are in a healthy state of mind, then only you can give your best in your exam. So make sure you practice healthy eating habit, have proper exercise and do not stress out a day before the exam, to give out your best during the exam. Examination day is very important day, as this is the day that you have waited for the whole year. You have been studying whole year for this day and it’s your time to give out your best and your future is quite dependent on the performance you give in during your exam. This is the reason that most of the students at times get a bit stressed up and end up messing things. There is no reason for you to get stressed if you have worked hard. Remember, hard work never goes wasted. It is better to avoid distraction of all kinds before you go to examination centre and remain focussed and motivated. Get up at a comfortable time in the morning, early enough that you reach your centre 30 minutes in advance and make sure that you have prepared you stationary in advance a night before and keep your stationary as well as admit card together at a safe place. Do not get up too early in the morning, and as soon you get up, behave normal and practice deep breathing to control your nervousness, also try mild exercise to stretch your muscles so that you have a good writing speed. Take your breakfast properly and have a balanced diet so that you do not feel low on energy during your exam. Avoid oily and fried food items. Once you reach examination hall, ask the teacher to explain the directions if you don’t understand them. Budget your time well in advance according the marks and use your watch to track the time. Don’t spend too long on any single answer. Read the questions carefully and make sure you answer the question that is actually being asked and not waste time writing anything out of the required curricula. Answering a different question then the one asked does not help you score. Start with the easy questions first and gradually when you tend to gain confidence and fluency then you are ready to attempt the difficult part. Mark the more difficult questions so you know to come back to them later. Come back to the more difficult questions only after you have answered the ones which are easy for you. Do not get distracted by anything during your examination and no matter what is happening around, remain focused. Once you have attempted your paper make sure you go through your answer sheet to check out that you have attempted everything that has been asked and also everything that you have done is correct. Once you are sure of everything, handover your answer-sheet to teacher on duty. Exposure to non-thermal radio frequency radiation from Wi-Fi and cellular phones can disrupt normal cellular development, especially fetal development. A 2004 animal study linked exposure to delayed kidney development. These findings were supported by a 2009 Austrian study. In fact, the disruption of protein synthesis is so severe that authors specifically noted, “this cell property is especially pronounced in growing tissues, that is, in children and youth. Consequently, these population groups would be more susceptible than average to the described effects.” In short, bathing the developmentally young in Wi-Fi increases their risk of developmental issues. When a group of Danish ninth graders experienced difficulty concentrating after sleeping with their cell phones by their head, they performed an experiment to test the effect of wireless Wi-Fi routers on garden cress. One set of plants was grown in a room free of wireless radiation; the other group grew next to two routers that released the same amount of radiation as a cell phone. The results? The plants nearest the radiation didn’t grow. Just as the Danish high schoolers noticed problems with concentration, scientists have begun to look at the impact of 4G radiation on brain function. Using MRI technology, research performed just last year found that persons exposed to 4G radiation had several areas of reduced brain activity. …Because we’ve known for a long time that the heat generated by laptops kills sperm. Well, now it turns out that heat isn’t the only threat to a man’s virility. Research has found exposure to Wi-Fi frequencies reduce sperm movement and cause DNA fragmentation.Both human and animal testing has confirmed that exposure negatively affects sperm. And, it’s not just sperm. The results of an animal study suggest that some wireless frequencies may prevent egg implantation. During the study, mice exposed 2 hours a day for 45 days had significantly increased oxidative stress levels. The cellular damage and impact on DNA structure from exposure suggest a strong possibility of abnormal pregnancy or failure of the egg to implant. This is extremely controversial but we can’t ignore that plenty of animal models indicate that exposure to electromagnetic radiation increases the risk of tumor development. While human studies are rare, reports and case studies abound. One such case involves a young 21-year-old woman who developed breast cancer. What makes this case unique was that her family did not have a predisposition to breast cancer… and she developed the tumor right on the spot she carried her cell phone in her bra.